I hate obituary cartoons. I mean I really hate them. I hate the St. Peter imagery and the Heaven thing. Bleagh! After losing my job in 2012 I thought “I’ll start my own syndicate and nobody will make me draw nice cartoons ever again.” I’m going to remain irreverent and original. It keeps me poor but I’ve mostly stood by my principles. It’s not that I don’t like nice stuff. I just don’t think they’re editorial cartoons. They’re terrible. This cartoon is terrible and I bet you love it. My clients are going to love it. Here’s why I drew it: I dropped an N-bomb in yesterday’s cartoon. I knew some, if not most of my clients would hate it. But I really wanted to make that statement. I felt after dropping the dirty word, even with asterisks, that I should do something nice for my newspapers. Two clients wrote to tell me they hated the dirty word cartoon. One client (in Texas) dropped me. But when I sent the cartoon to my newspapers I attached a message that I knew it was a dangerous cartoon but I’d try to do something much softer tomorrow. I didn’t expect this but I did this. 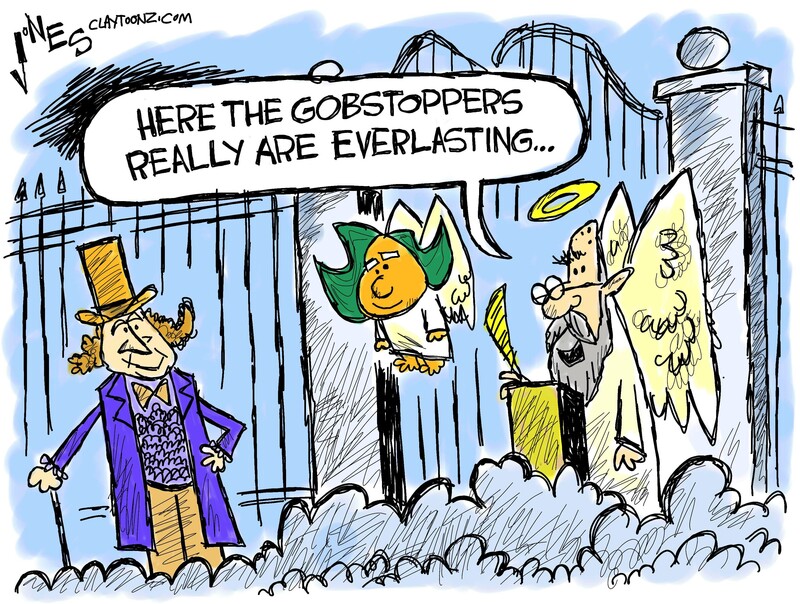 I was thinking what would a horrible cartoonist do with Gene Wilder’s death. What would be just so sickening sweet that it’d make me groan? I thought of this without any effort. Then I thought I’d go ahead and do it kind of on a lark. I also drew it without much effort. I even threw in an Oompa Loompa. It’ll make a national publication. Watch. The Oompa will seal the deal. It did help that I love Gene Wilder. He was awesome in so many things and not just a great and funny actor, he could write. He co-wrote Young Frankenstein which many believe is the greatest comedy of all time. It’s hard to argue against that. My personal favorite however is Blazing Saddles. One thing I found interesting were a few memes I saw where people said Wilder and Richard Pryor are reunited. Gee that’s nice. Hey, maybe he’ll see his wife up there. But hey, if I’m going to do a bad obituary cartoon, I’m going to do a really good bad obituary cartoon. Nobody’s going to have the gobstopper idea. Even if it is ridiculous.